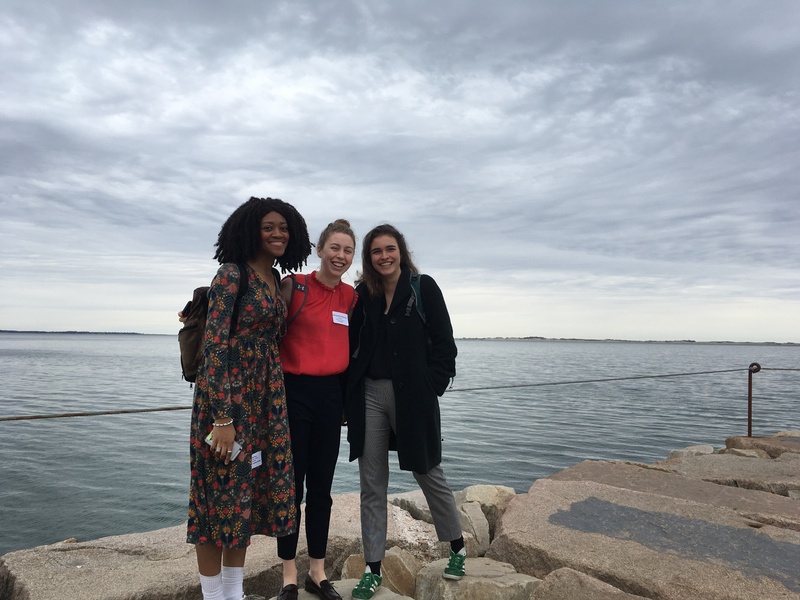 Bolaji Olateru-Olagbegi, Samantha Morton, and Katharina Voehler in Plymouth Harbor after their presentations at the MA Sustainable Communities and Campuses Conference. Since 2010 environmental conference organizer Jen Boudrie has brought hundreds of people together at the premiere event in Massachusetts for environmental experts, professionals, activists, officials and academics. At this year’s conference in Plymouth Harbor, three BU students presented their work in the class Research for Environmental Agencies & Organizations (GE 532). Samantha Morton researched how to promote the retention of trees for state conservation officials, and with others provided a review of the scientific literature on the effects of neonicotinoid pesticides on bees to the Executive Office of Environmental Affairs. Bolaji Olateru-Olagbegi presented her project for the Boston Public Health Commission, investigating whether health providers understand that some of the symptoms they see might be caused by toxic exposures, and with Katharina Voehler explained the work their team performed for the City of Boston on Community Choice Aggregation – bulk purchasing of energy for residents that can be used to promote cleaner energy (and local generation of cleaner energy). Instructor Rick Reibstein also presented at the conference on the history and future of clean water, including water quality data analyses that Alex Kerr and Michael Silano conducted for the Massachusetts Department of Environmental Protection.